On the first of three big days in the mountains, Alberto Contador set out his stall to attack race leader Joaquin Rodriguez’s slender advantage, but it was the Katusha rider Rodriguez who turned the tables on Contador, responding to his attacks, neutralising them with the help of his right hand man Dani Moreno, before once more snuffing out Contador’s charge for the line at the summit of the 1,470 metre Puerto de Ancares. 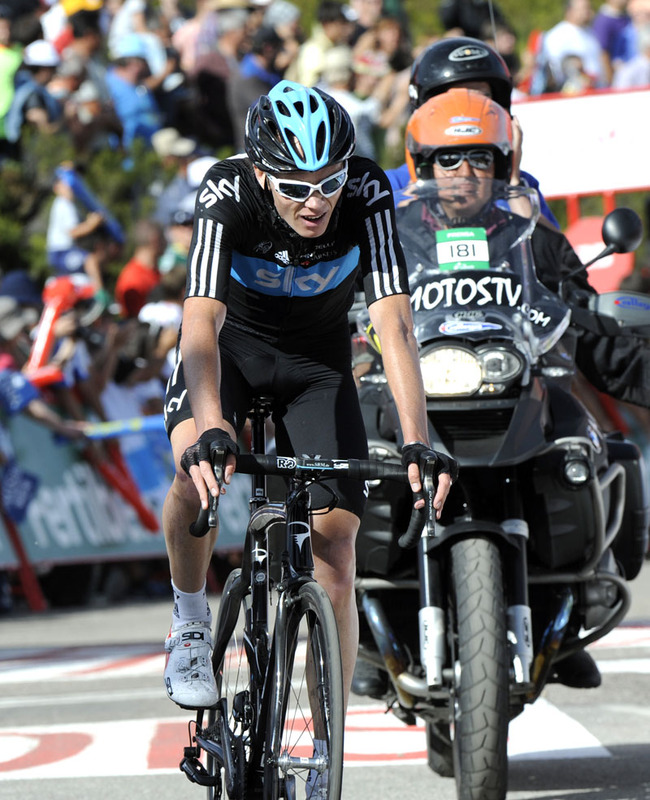 The net result was that Rodriguez increased his lead in the Vuelta a Espana – thanks to the time bonus on the line – as well as dealing Contador a crushing psychological blow. Contador was so frustrated and angry that he pushed aside Spanish radio journalists waiting for his comments immediately after the line – it was clear that the day hadn’t gone as he had hoped. While it had been widely predicted that Rodriguez would perform well on the shorter, steeper climbs in the opening week, the time trial and the arrival of the ‘big’ mountains was meant to signal the end of Rodriguez’s time in the red jersey of leadership. So far Rodriguez has confounded expectations with a gutsy ride in the hilly time trial on stage 11, while this result suggests that ‘Purito’ is not going to crack. The day’s break was a 16 man group, featuring Orica-GreenEdge man Simon Clarke who used the day to rack up a bundle of points on the four categorised climbs that the break was clear on during the 149km stage (Clarke won three out of the five climbs on the day). 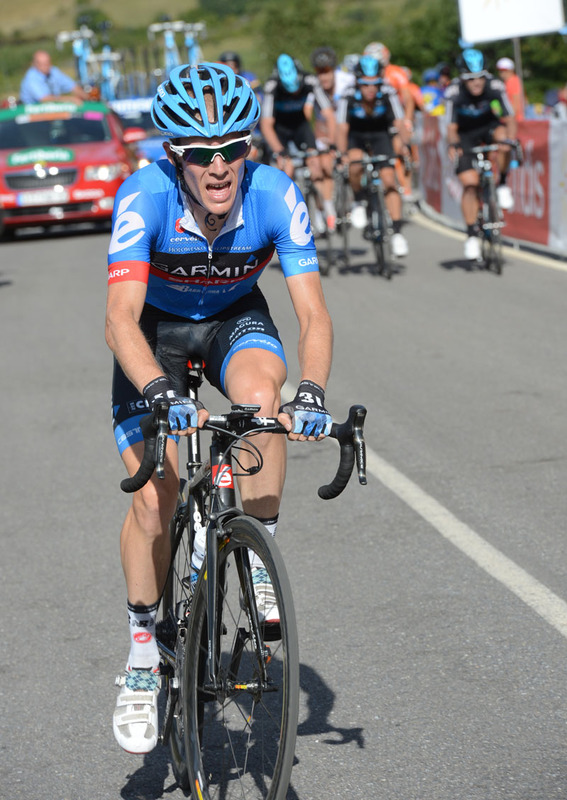 All of which meant that Clarke ended the day as leader of the mountains classification. By the time the break got to the penultimate climb – the first category Aigas – they had 2-22 on the still large bunch led by Saxo Bank and it was clear that, with 31 kilometres to go and a first category climb to the line, none of them was going to contest the stage finish. The ‘Last man standing’ award goes to Katusha rider Alberto Losado, who was caught with around three kilometres to go as the Saxo Bank team shredded the bunch in very short order. With Sergio Paulinho piling on the pressure on the lower slopes of the nine kilometre final climb, the 70 man group rapidly thinned out to the point at which there was a very select group of 15 riders was all that was left. Among the casualties were Rabobank duo Robert Gesink and Bauke Mollema, although Laurens Ten Dam was clearly given the OK by the team to ride his own race rather than hang about with his spent Rabobank team mates. Under repeated attacks and accelerations from Contador the group of 15 turned into a group of five – Contador, Alejandro Valverde (Movistar), Rodriguez, Moreno and Andrew Talansky (Garmin) as Chris Froome relied on Sky team mates Roberto Uran and Sergio Henao to keep him in touch before striking out on his own to rejoin the leading group. 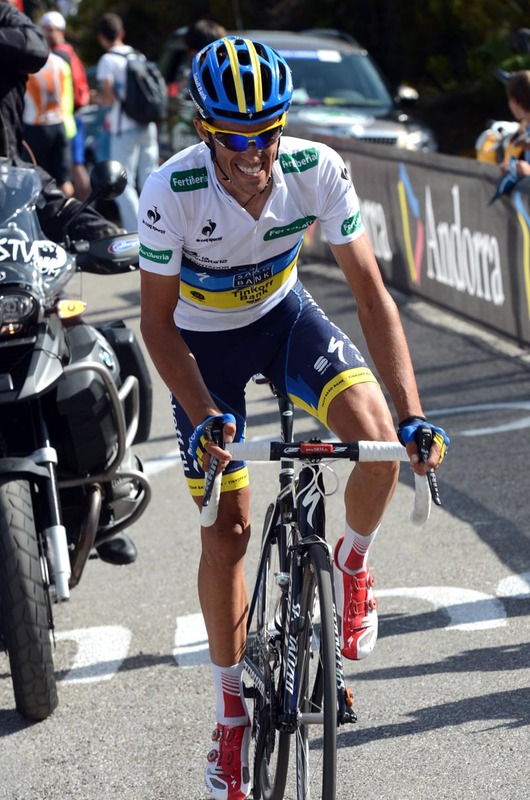 Inevitably, with two kilometres to go, Contador attacked fiercely and, although it briefly looked he had cracked Rodriguez, the race leader bridged across before sprinting past him through the delirious crowds to win the stage, take the bonus, put five seconds into Contador on the line and break Saxo Bank’s rider into the bargain. There are two more mountain stages to go before the peloton of the Vuelta gets a break but, on this showing, it’s hard to bet against Rodriguez after today’s showing.